Sola Scriptura , the formal principle of the Protestant Reformation, is essential to genuine Christianity, for it declares that the Bible is the inspired word of God, the church’s only rule of faith and practice. Yet this doctrine is under assault today as never before, both from outside and and inside the church. I’ve had this book in my library for quite some time. Just a few weeks ago I picked it up, not knowing what to expect, and was blown away by the Foreward and Introduction. Below are a few quotes to whet your appetite for this amazing book! 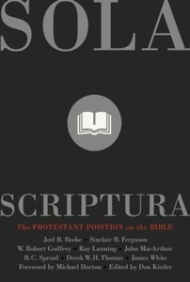 Quotes taken from Sola Scriptura: The Protestant Position on the Bible.